A Northwestern University research team has developed tiny optical elements from metal nanoparticles and a polymer that one day could replace traditional refractive lenses to realize portable imaging systems and optoelectronic devices. The flat and versatile lens, a type of metalens, has a thickness 100 times smaller than the width of a human hair. "This miniaturization and integration with detectors offers promise for high-resolution imaging in devices from small wide-angle cameras to miniature endoscopes," said Teri W. Odom, who led the research. She is the Charles E. and Emma H. Morrison Professor of Chemistry in the Weinberg College of Arts and Sciences and chair of the department of chemistry. The properties of metalenses depend on the rationally designed arrangement of nanoscale units. Metalenses have emerged as an attractive option for flat lenses but are currently limited by their static, as-fabricated properties and their complex and expensive fabrication. For imaging operations such as zooming and focusing, however, most metalenses cannot adjust their focal spots without physical motion. One major reason, Odom said, is that the building blocks of these lenses are made of hard materials that cannot change shape once fabricated. It is difficult in any materials systems to adjust nanoscale-sized features on demand to obtain tunable focusing in metalenses. "In this study, we demonstrated a versatile imaging platform based on fully reconfigurable metalenses made from silver nanoparticles," said Odom, a member of Northwestern's International Institute for Nanotechnology. 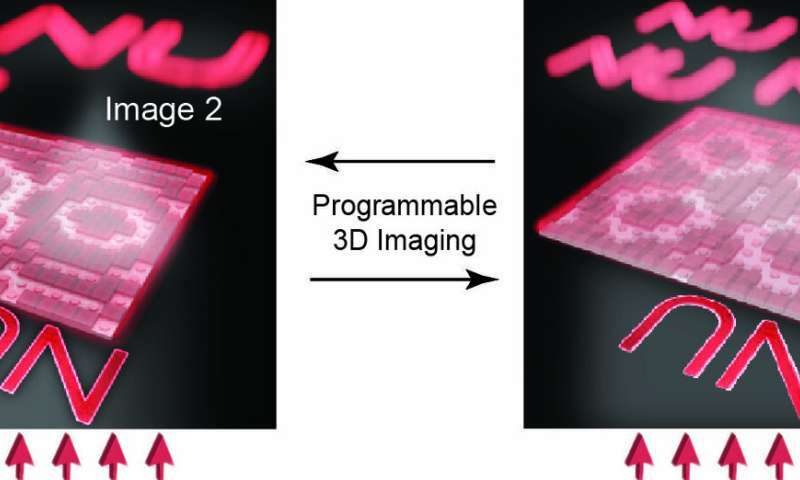 "During a single imaging session, our metalens device can evolve from a single-focus lens to a multi-focal lens that can form more than one image at any programmable 3-D position." The paper, titled "Lattice-Resonance Metalenses for Fully Reconfigurable Imaging," was published recently by the journal ACS Nano. The Northwestern team built their lenses out of an array of cylindrical silver nanoparticles and a layer of polymer patterned into blocks on top of the metal array. By simply controlling the arrangement of the polymer patterns, the nanoparticle array could direct visible light to any targeted focal points without needing to change the nanoparticle structures. This scalable method enables different lens structures to be made in one step of erasing and writing, with no noticeable degradation in nanoscale features after multiple erase-and-write cycles. The technique that can reshape any pre-formed polymer pattern into any desirable pattern using soft masks made from elastomers. How do I got back one to five years, get all the "one day!" stories and see how many of these ethereal ideas have ever become actual products? Durable roads infused with rubber tire waste, hydrogen power, microscopes that cost nothing, diffractionless lenses, all of it. You pay your taxes and quit whining. And as for how it will work, you'll turn a dial on the camera and it will change the lens.